Ok, I have been having a full on committed relationship. Most of my friends know this about me. When asked my favorite breakfast I will almost always say “Steak and Eggs…hold the eggs.” I’m the girl that doesn’t even have to reheat leftover steak. I will go National Geographic on a T-bone at 8am. Steak and I don’t see each other that often anymore. I’ve been having this thing on the side with kale and some late nights with re-fried black beans and their hussy friends, the corn tortillas. Oh, and Green Juice. That has been getting hot and heavy. But when steak and I get together, magic happens. 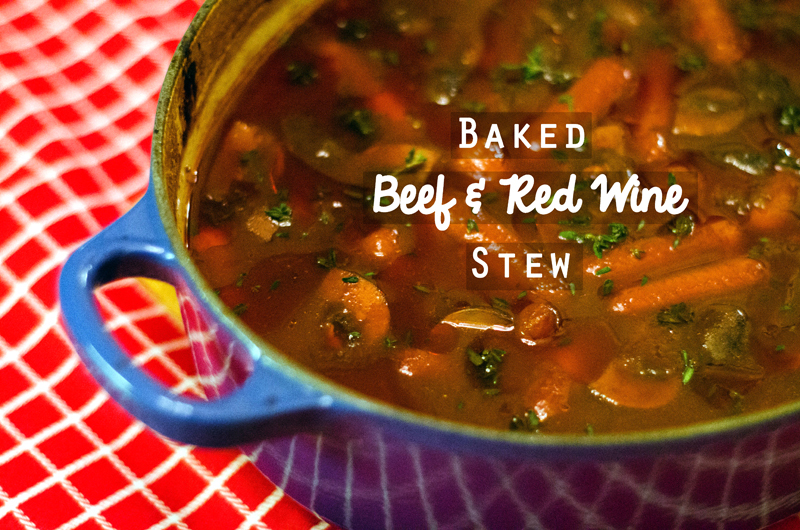 I had never baked a stew before. Why did I not figure this out sooner? The meat becomes fall-apart tender. I added in a whole bottle of wine, making it all very good and drunk. It’s rich and full in flavor. Did I mention there are mushrooms in it too? Oh, yes. All served over a bed of creamy garlic mashed potatoes? Bam. Home-run. You can run the bases now and high-five everyone in your path. In a dutch oven or other oven-safe pot, heat up enough olive oil to lightly coat the bottom of your pot. Once your oil is heated, add your chopped onions and garlic. Saute until the onion becomes translucent. Add in your stew beef. Spice it up with salt, pepper and granulated garlic. Brown it on all sides. Add in the whole bottle of red wine, your beef broth, your bay leaves and your thyme. Once it has reached a simmer, put the lid on your pot and transfer it to the oven. 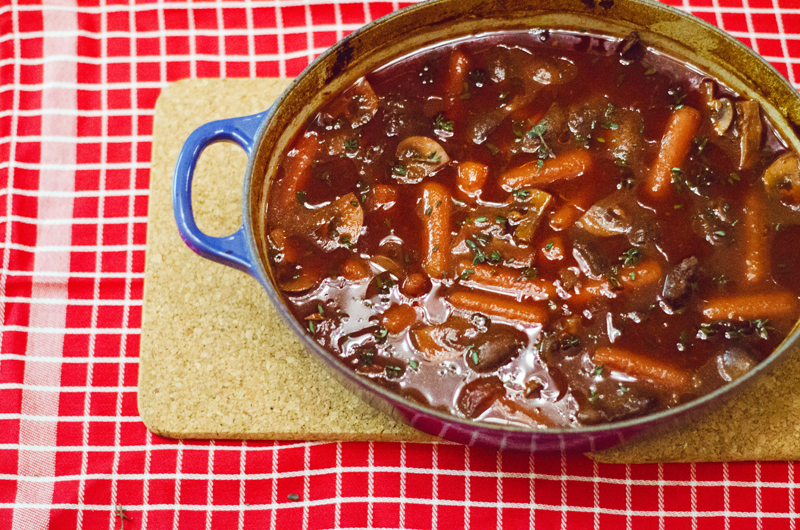 After 90 minutes, remove the pot from the oven and add in your mushrooms and your carrots. Return to the oven and bake for an additional 30 minutes. While your stew is finishing, peel and quarter your potatoes. Fill a medium-sized pot with hot water and a decent amount of salt. This will help give flavor to your potatoes as they cook. Bring your water to a boil. Add in your potatoes and let them cook for 15 minutes, or until tender. Drain your potatoes and transfer them back to your pot. Add in your garlic and your heavy cream. Using an immersion blender, blend until creamy and smooth. If you do not have an immersion blender you could use a hand-mixer or simply mash them by hand. 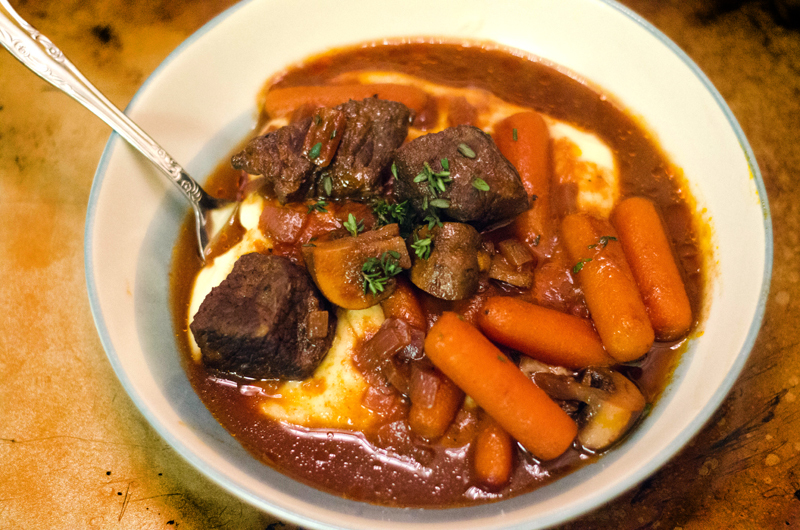 When your stew is ready, remove it from the oven and allow to cool for five to ten minutes. 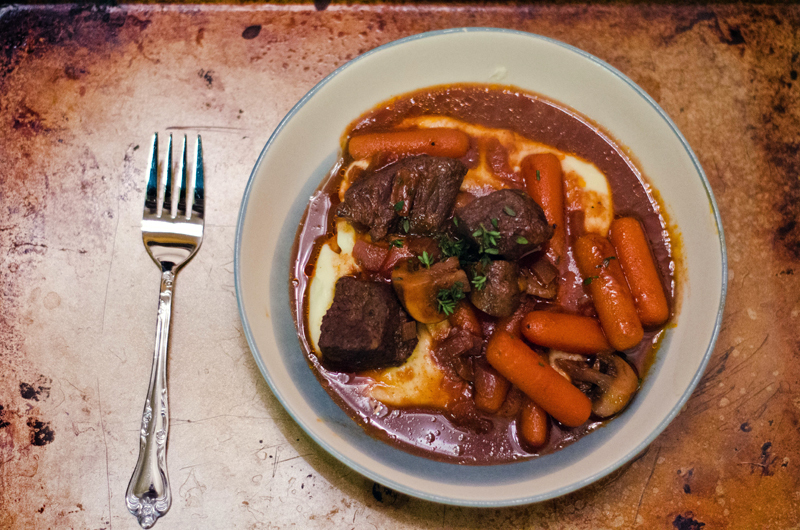 Serve over a bed of mashed potatoes, and garnish with thyme. Maybe eat the leftovers for breakfast the next morning. Not maybe…definitely. Um, why didn’t we hang out in college? You are like butter to my gluten free bread. And basically I just want to be invited to dinner at your house. Do you know the size of the bottle of wine you used? Like, how many cups? The particular burgundy I like comes in different sizes and the “normal” size bottle of wine that I have, has a different measurement on it then the bottle I bought to make the stew with. I was going to print the recipe and it was 7 pages long! For one recipe! It would be very helpful if there was a printer friendly (and ink, paper and tree friendly) version we could print. This sounds like a great recipe and I’m making it tonight for supper, but first I’m going to have cut and paste it into a word document to get it down to a 1 page version. This recipe is older, so it has not been updated yet. You’ll see that most of my recipes from 2013 have a printer friendly version at the bottom of the page. What measurement of red wine is used? I would like to shop and get the ingredients today. Thank you. Just buy a normal sized bottle of red wine. Nothing huge. The exact ounces shouldn’t matter, it’s really more about the flavor. I’ve made it with several different bottles of red that I’m sure were slightly different in volume. Hope you enjoy it!